Since 1967, Lorne Shields has developed a detailed knowledge of bicycle history and his collection is now considered a national treasure. In the 1980s, he donated a portion of his collection, including 42 world-class bicycles, to the Canada Science and Technology Museum in Ottawa, Ontario. Item 1 from this series - the Big Jug - can be found here. Three skirt lifters from the collection of Lorne Shields. Details below. One of the dandiest cycling accessories ever invented for the wheel woman: The skirt lifter. 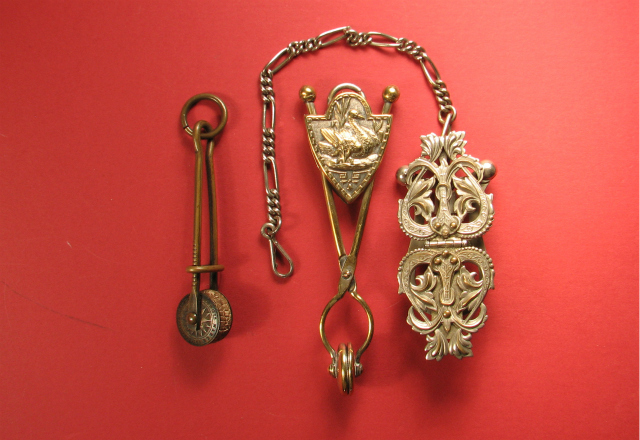 All of the skirt lifters featured here are made in England and were commonly used by female cyclists during the 1890s -- the days of the dandyhorse. There were literally hundreds if not thousands of various designs on the market. The divided skirt was made possible by - or, perhaps, preceded by - the skirt lifter. The device could be used to create an ad hoc pant-like garment for riding. The skirt lifter could also be simply used in the front to lift the skirt out of the way when climbing stairs or mounting a wheel or horse. It was also used towards the back of the skirt for picking up long trains that were fashionable of the period, keeping them dirt free. The working of this lifter above was to lower the oval ring down the arms close to the tabs which forced the tabs tight against the cloth. Brass wire with white rubber buttons inside the tabs hold the cloth firmly in place when closed. The ring rested on ribs etched into the arms so the mechanism held in place. Once the cloth was held at the back of a dress it was pulled forward and then upwards. 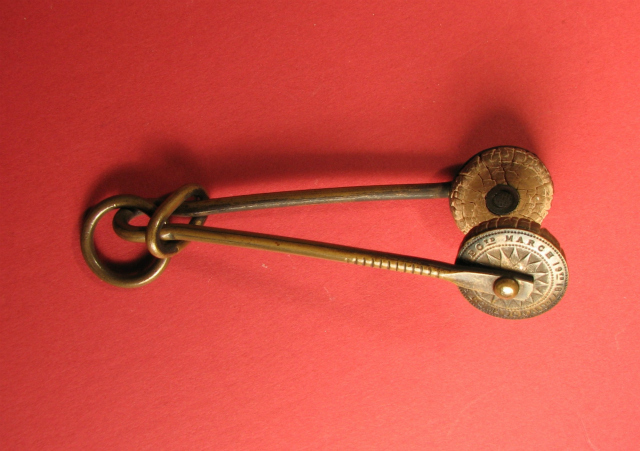 It was then attached to a chatelaine or buckle attachment. They formed a pant like function for the lady of the day. 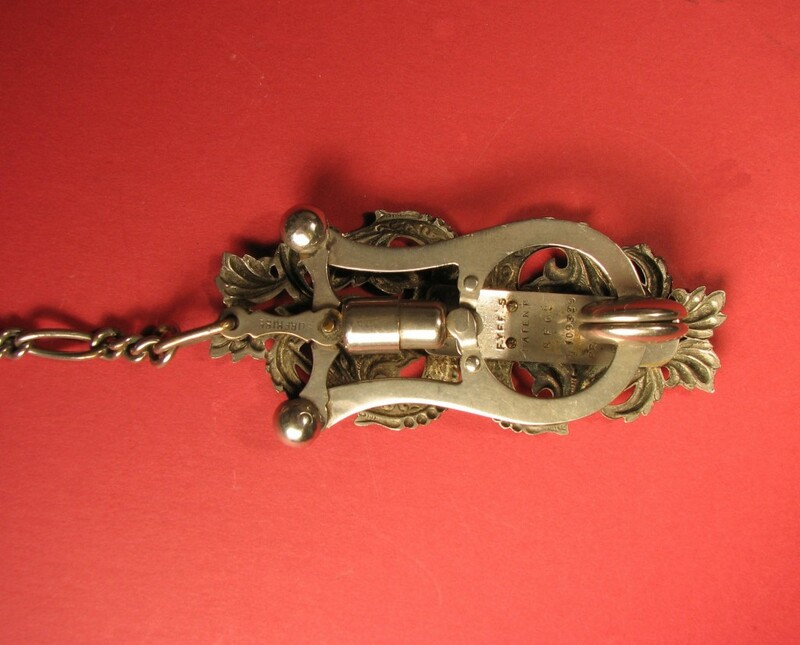 This skirt lifter above has a plunger mechanism with decorative “butterfly” style cover. The cover opens at the hinge on the front panel and exposes two ball ends at rear. When the ball ends are manually pressed together the tabs open. The back of the dress was inserted within the open tabs. The tabs closed automatically when released with the aid of a spring-loaded plunger. The wings were folded back. The skirt lifter was pulled forward and up. 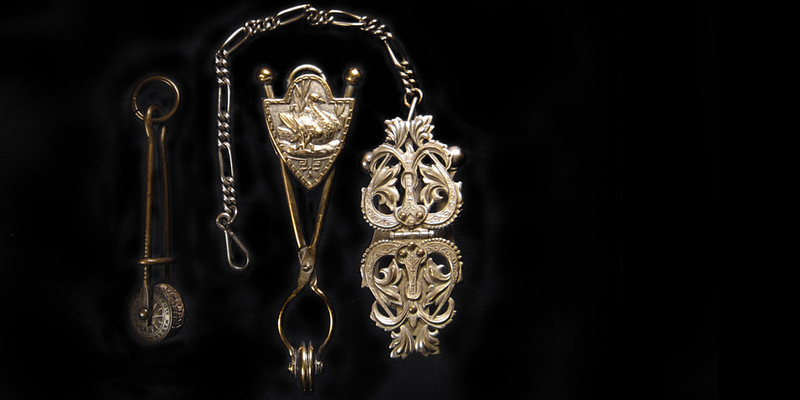 The clip and chain attached to a chatelaine. 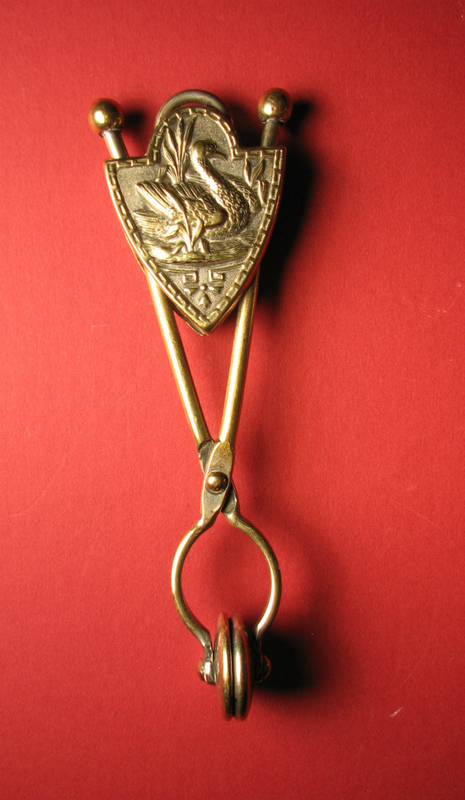 This skirt lifter above is a hinged style with embossed decorative covers illustrated with a swan in a marsh. The cover slides up and down the legs either allowing the opening or forcing the closing of the tabs. One side of the tab has a rubber pad catching the cloth within the tab with a concave tab. Total manual operation. 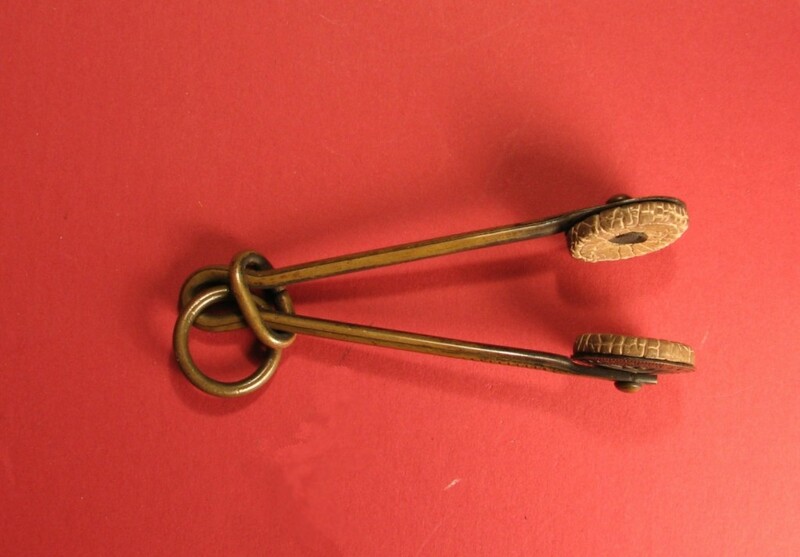 This skirt lifter is the earliest design. Patent date March 19, 1877 to C. McDonald. Length when closed: 11 cm. 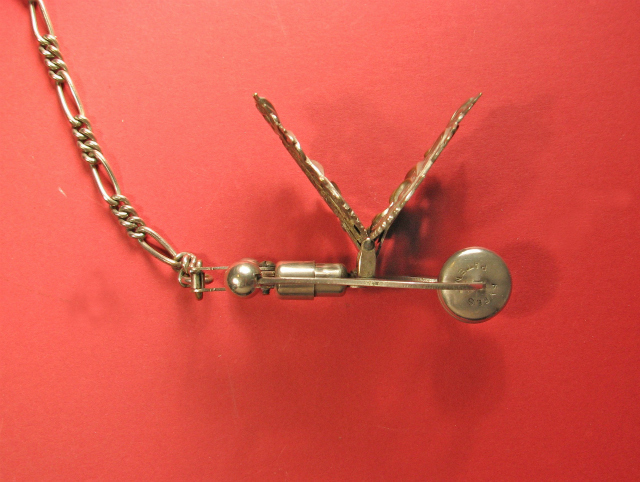 Skirt lifter with figural pierced decorative cover made of nickel-plated steel. This model is identified as "SURPRISE" in patent information. Length: 10 cm. Length of chain to end of clip is 20 cm. Widest point is 4.3 cm. 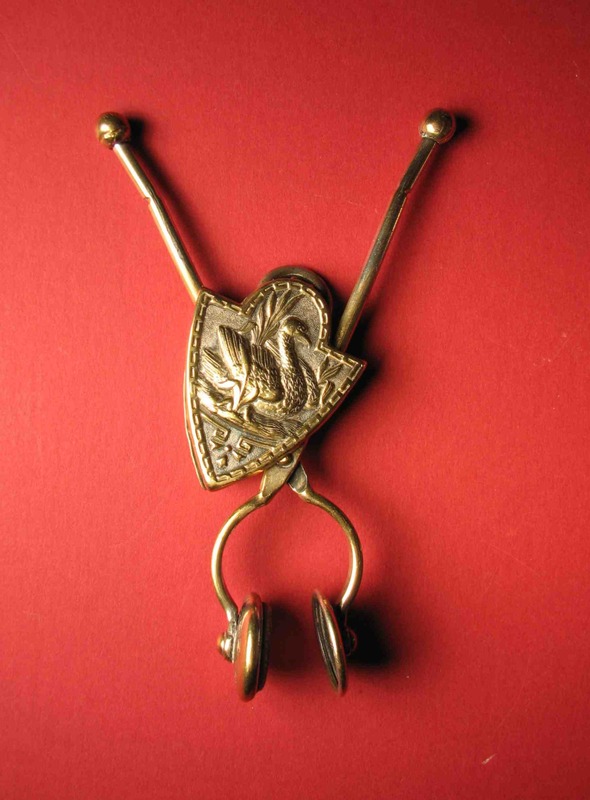 Brass skirt lifter with figural shields artistically designed. Length: 13 cm. Widest point is 4 cm. It was very popular among women cyclists of the late 1800s and earlier 1900s: Victorian ladies who were required to remain fashionable and demure while getting exercise in public. “There are four types of bicycling costume for women -- the full knickerbocker, resembling the regulation wheelman's suit; the fuller, longer bloomer; the short skirt with leggings; and the skirt to the top of the shoe. The last is the one decreed by fashion. …for the leisurely rider of levee roads in fair weather, and for the woman shy of comment, it gives a suitable garb, together with that comfort which conformity brings. Its convenience at present is that the cyclist can step off her wheel into the shop or house and be clad as her uniformed sisters are. It is often said that the bicycle has done more for the emancipation of women than anything else in the world. Susan B. Anthony wrote it most famously in 1896 – indeed, in the days of the dandyhorse – when suffragettes around the globe were taking to the wheel and causing a stir wearing pantaloons, demanding equality for women. The skirt lifter surely played a part in the natural development of bloomers (essentially baggy trousers cinched at the knee) in women’s fashion. Of course, women were ridiculed and even treated like prostitutes by local authorities for wearing them …at first. But, soon women came together to take a stand. Some formed The Rational Dress Society, which protested against any fashion that either deformed the figure, impeded movement, or in any way injured the health. It included items such as tightly fitted corsets, high-heeled or narrow-toed boots and shoes; heavily weighted skirts and under-clothing (without shoes) that exceeded the weight of seven pounds – all of which rendered healthy exercise like riding a bicycle almost impossible on its no-wear list. And as evidenced more recently by things like this flash mob in Leicester celebrating the bicycle and women’s emancipation and the cycling suffragette Alice Hawkins it seems cycling still has a great affect on women living life to the fullest by "taking to the wheel" today too. All hail the mighty skirt lifter! Item 1 - the Big Jug - from the series How we got here: from the days of the dandyhorse (from the collection of Lorne Shields) can be found here. How do you avoid getting your skirts tangled in the back wheel, chain or sprocket? Send us your dandy (or not-so-dandy) tips and tales and we'll post them on our dandyBLOG. Email info @ dandyhorsemagazine.com or leave a comment here.